The elections in Iran are over and the reformist-backed candidate, Hassan Rouhani, has won the elections. Predictably, the coverage in the US has all been about the nuclear issue as if Iranians were only voting for that. For that matter, there rarely is a recognition that the elections are held regularly in Iran and the turnout is consistently high. Yes, The Supreme Leader and The Guardian Council can veto legislation and disqualify candidates, nevertheless, the President is not completely toothless. If that was the case, then the participation in the voting would not be that high. In fact, the turnout in the last US elections was 57.5% compared to 72.2% in the Iranian elections. 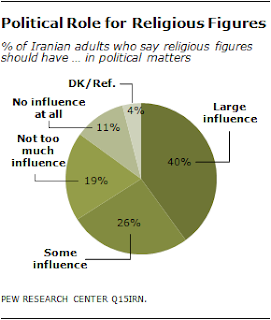 A recent Pew survey that shows that a majority of Iranians do want a political role for religious figures. Now first, "political role" can be understood to have a very broad meaning, and second, most Iranians follow Shi'a Islam, where there already is a more established religious hierarchy compared to the run-of-the-mill Sunni equivalent.